A new fixed-span bridge means the revered paddle-wheeler will be restricted to Long Lake after a final, emotional trip next Saturday. NAPLES – As “Auld Lang Syne” played from a loudspeaker and passengers hung over the railing on the upper deck, the Songo River Queen II passed through the gate at Songo Lock for the next-to-last time on Saturday. After 40 years of cruises, the paddle-wheeler will take its final trip next Saturday from Long Lake, across Brandy Pond, to the lock on the Songo River and back. 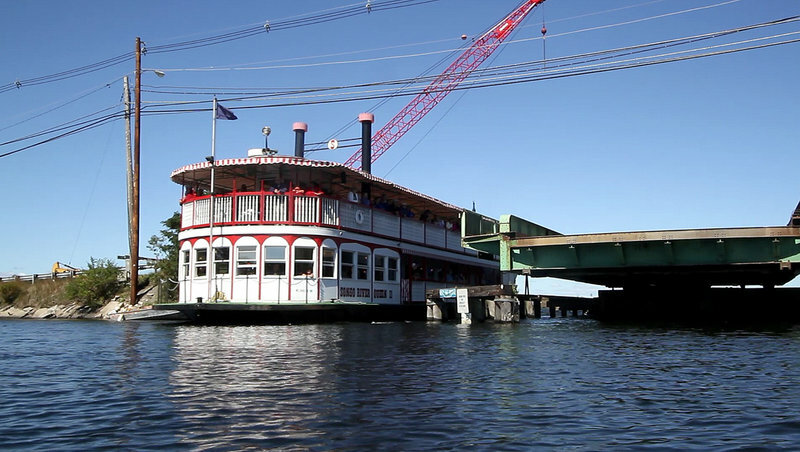 The bridge at the Naples causeway swings aside to allow the Songo River Queen II to pass between Long Lake and Brandy Pond to access the Songo River and Sebago Lake. The bridge is being replaced by one that won't allow the boat to pass. 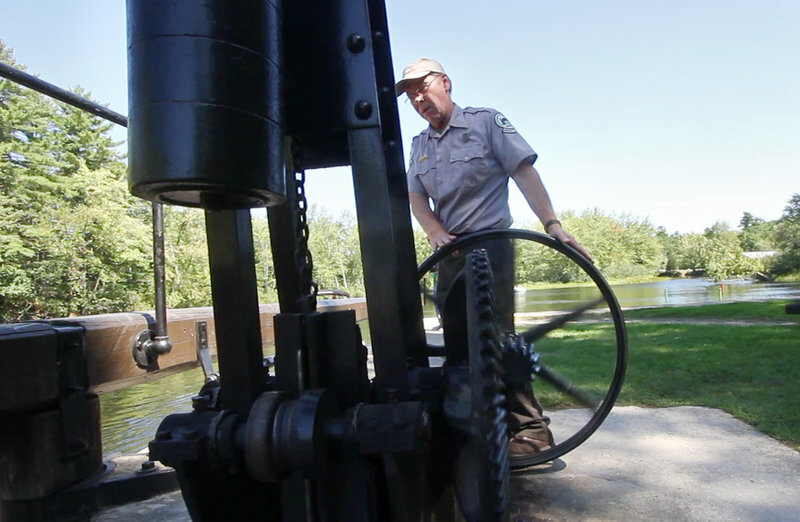 Sam Chute of the Maine Department of Conservation operates the hand-turned mechanism that opens and closes the Songo Lock. Passing through the historic lock has been one attraction of riding on the Songo River Queen II. Once the boat crosses the Naples causeway at the end of the 2½-hour cruise, a swing bridge that’s been in operation for six decades will close shut, never to open again. “I’m telling you, I will have tears in my eyes,” said Ron Terciak, the captain of the Songo River Queen II for the past nine years. “Knowing I’ll never be doing this trip again — the Queen will never be doing this trip again — I get emotional just thinking about it,” he said. The swing bridge is being replaced by a fixed-span bridge as part of an $8.4 million project to improve the causeway, which is also getting a new walkway and seawall. The new bridge, which is slated to open next May, will be 12½ feet above the water level — about 7½ feet higher than the swing bridge, but not nearly high enough to accommodate the monstrous double-decker Songo River Queen II. The paddle-wheeler’s dock is on Long Lake and, after next weekend, the boat will be limited to that body of water. Kent Uicker, who bought the business three years ago, said he doesn’t know how badly losing the locks cruise will affect his bottom line. “That’s all in a crystal ball right now,” he said. The original Songo River Queen, a 65-foot-long replica of a Mississippi River paddle-wheeler, began touring the lakes and the lock in 1971, said Uicker. Back then, passengers were allowed to smoke during the cruises, he said, and an unextinguished cigarette discarded in a trash can is the suspected cause of a fire that destroyed the boat in October 1981. A super-sized, 93-foot-long replacement was built that winter and was in the water the next spring. 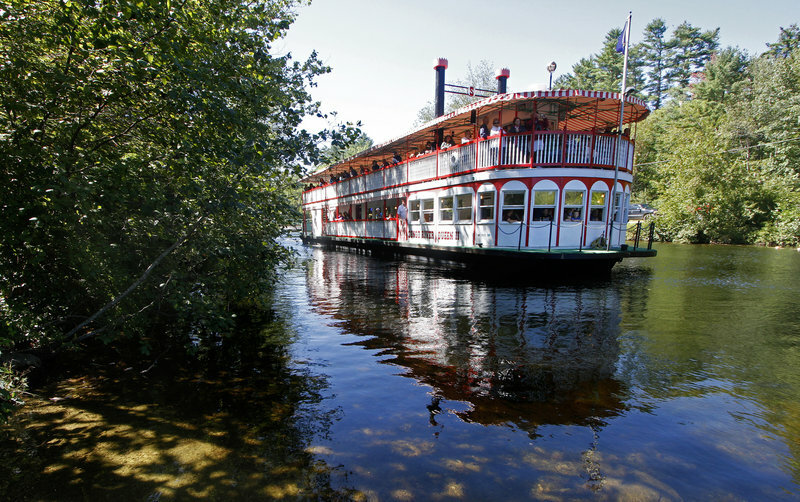 Since then, the Songo River Queen II, with its red-and-white striped awning, has been a fixture on Long Lake, drawing locals and tourists to the causeway for cruises from May to October. About 155 passengers boarded the boat on Saturday. On the upper deck, groups of friends sat at picnic tables, sipping bottled beer and Bloody Marys. Others were on benches in the front of the boat, looking out quietly at the water shimmering in the sun and at the cabins and cottages nestled in the pine trees by the shore. Without fail, passengers in passing motorboats would wave at the Queen, as did people sitting in Adirondack chairs on their lawns or sunbathing on boat docks off their back yards. “It’s the camaraderie on the Songo River. It’s such a nice community,” Maggie Wilson said of what she liked best about the cruise. Wilson and her husband drove up to Maine from Rochester, Mass., on Saturday just to ride the Queen. They’d recently heard on the news that the locks cruises were ending, and they were struck by the historic significance. “We were fascinated with the story and decided it was something we had to do,” Bob Wilson said. For those who ride the boat every week, the change is more personal. Nancy Laurent, who works at the snack bar on the lower deck, said she’ll miss seeing passengers crowd into the front of the boat and press against the windows to watch the lock fill up with four feet of water and lift the boat onto the higher part of the river. “I love to watch everybody’s expressions,” she said. Jim Allen, owner of the Naples Marina on Brandy Pond, said summers will be different without the Queen passing by, though he believes, overall, the bridge replacement will be better for boaters. It will also improve the flow of traffic over the causeway, as cars on that section of Route 302 won’t have to stop every two hours when the bridge opens to let boats through. Support for the project wasn’t as forthcoming a couple of years ago when the Maine Department of Transportation was deciding how to replace the aging swing bridge. 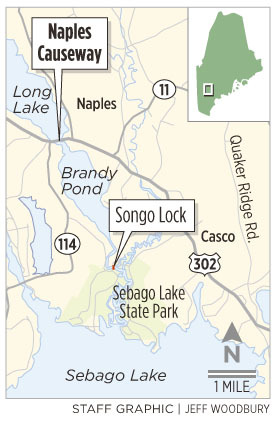 A contingent of local residents who fought against the fixed-span bridge feared marinas and other businesses along the causeway would suffer because larger boats, including the Songo River Queen II, wouldn’t be able to travel between Long Lake and Brandy Pond. Allen, who is a member of the town’s Causeway Restoration Committee, said there’s only one boat in his marina that’s too tall for the new bridge. Many others that can pass through will now be able to do so at anytime during the day, and not be subject to the schedule of the swing bridge.